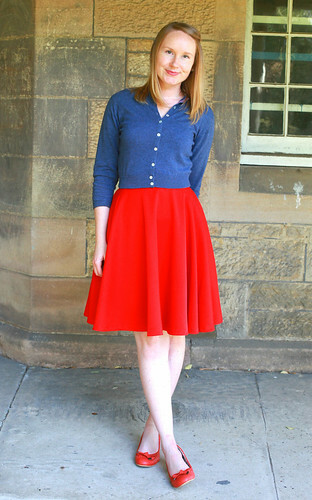 Yup, that’s right, I’m totally a Lady (in a red skirt…). I actually finished this self-drafted circle skirt a few weeks back and it’s quickly made itself a staple in my wardrobe. I’ve worn it at least once a week since I made it! 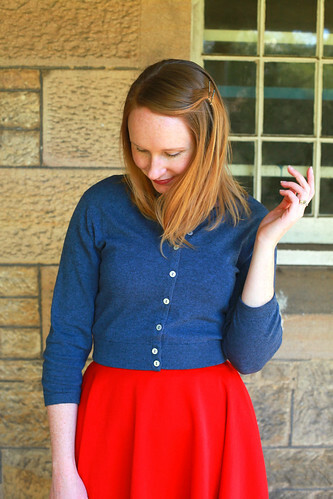 And while I completely admit to it probably not being the most exciting thing to ever have graced the lovely pages of We Sew Retro, it’s pretty and functional and fits in well in my wardrobe with all of strange spring weather we are having here in Sydneytown. This is really pretty! I love the color. What kind of fabric is this? It seems to have a lovely weight and sheen.